Back in January of this year, the HDMI Forum announced details on the latest HDMI specification, HDMI 2.1. The new spec was expected to be available to members in second quarter of this year, with products to begin rolling out possibly by late 2017 but mostly in 2018. What does the arrival of HDMI 2.1 mean for you? Let's talk about what the new spec brings to the table and how it will affect your current and future AV purchases. On paper, the most noteworthy advancement of HDMI 2.1 is in the area of bandwidth. The current HDMI 2.0 chipset supports a maximum bandwidth of 18 Gbps. HDMI 2.1 jumps all the way up to 48 Gbps, which means support for much higher resolutions and frame rates. The HDMI Forum specifically lists the following resolutions as being supported by HDMI 2.1: 4K/50 or 60, 4K/100 or 120, 5K 50 or 60, 5K/100 or 120, 8K/50 or 60, 8K, 100 or 120, 10K/50 or 60, and 10K/100 or 120. Obviously the industry is a long way off from needing to transmit 10K/120 over consumer gear, but the new spec does makes 4K/120 viable, which is enticing news for gamers in particular. Like the current HDMI 2.0 spec, HDMI 2.1 supports BT.2020 with 10-, 12-, or 16-bit color. Speaking of gamers, the new spec supports a feature called Game Mode Variable Refresh Rate, which according to the HDMI Forum "enables a 3D graphics processor to display the image at the moment it is rendered for more fluid and better detailed gameplay." Essentially Game Mode VRR is designed to cut down on motion blur and input lag for gamers. According to CNET's Geoffrey Morrison, the technology is similar to NVIDIA's G-Sync and AMD's FreeSync, both of which only work over a DisplayPort connection. 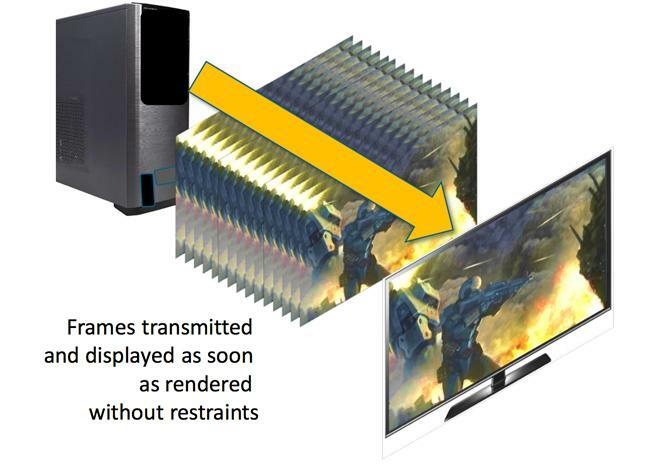 The addition of Game Mode VRR is designed to make HDMI a more compelling connection option in the gaming market. If you follow the world of High Dynamic Range video, then you know that metadata is the info passed from an HDR source to an HDR display that tells the display how to render the HDR content. The ubiquitous HDR10 format that's part of the Ultra HD Blu-ray spec uses static metadata, meaning that for each program the source sends a single set of metadata instructions to the display that applies to whole show. With dynamic metadata, the source can send the metadata on a scene-by-scene or frame-by-frame basis to ensure that the HDR content is "played at its ideal values for depth, detail, brightness, contrast, and wider color gamut." Basically this addition just makes it official that the HDMI spec supports all types of HDR, both static and dynamic. In reality, Dolby Vision already transmits dynamic metadata over current HDMI gear (and Samsung's HDR10+ format will, too). If you own a Dolby Vision TV from the likes of LG, Sony, TCL, or VIZIO, plus a Dolby Vision source like an Oppo UDP-203 or LG UP970, then you're already getting dynamic HDR, even though your connections are HDMI 2.0. Arguably the most meaningful addition right now for the home theater enthusiast is the introduction of eARC, or "enhanced Audio Return Channel." If you're not familiar with ARC, it's a feature of the HDMI specification (first introduced in v1.4, released in 2009) that allows you to send audio "upstream" from your TV's HDMI inputs back to your audio system's HDMI output in order to listen to the TV's internal audio sources, like smart TV apps and tuned over-the-air channels. This eliminates the need to run a separate digital or analog audio cable from the TV to your AV receiver, soundbar, or other HDMI-equipped audio device, making for a clean, one-cable solution. Read my story Everything You Need to Know About ARC (Audio Return Channel) for more details on the current version. Up to now, ARC has been limited to basic stereo or 5.1-channel Dolby Digital/DTS soundtracks, which is perfectly fine for current HDTV programming that's presented in these formats. However, the vast majority of today's TVs now have integrated streaming services, and these servces are slowly but surely moving up the quality channel, audio-wise. Netflix, Amazon Video, and Google Play use the Dolby Digital Plus format, FandangoNOW supports DTS-HD, and VUDU even offers access to Dolby Atmos soundtracks with some movie titles. The enhanced version of ARC in the HDMI 2.1 spec adds support for these higher-quality soundtracks, even object-based ones like Dolby Atmos and DTS:X. Will I Need to Buy New AV Gear and HDMI Cables? That is the million-dollar question, isn't it? As has been the case with every new HDMI update, HDMI 2.1 will be backwards-compatible with the current HDMI 2.0 spec. So, in the near future, if you were to add to your system a single AV component that uses HDMI 2.1, it would work with your older HDMI 2.0 components--although the system wouldn't support all the new 2.1 features, especially the higher bandwidth. 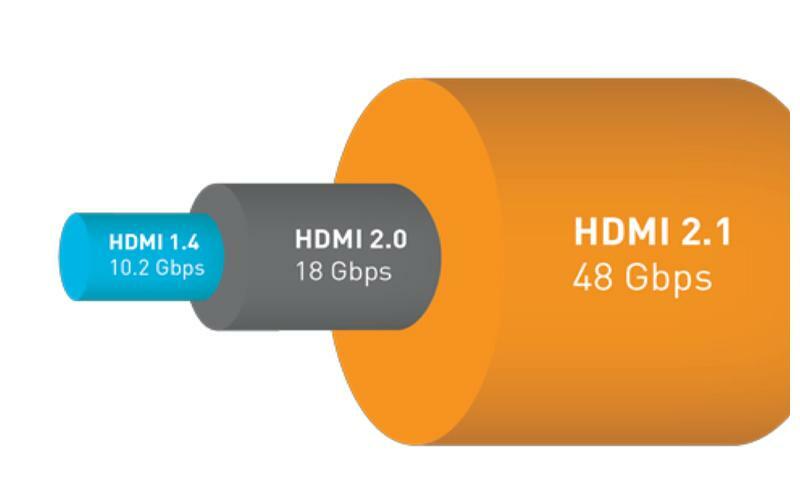 The HDMI 2.1 spec officially requires a new cable to support the higher 48-Gbps bandwidth (the connector will be the same)--and it's aptly called the 48G cable. If you actually needed to transmit a 48-Gbps signal, then yes you would need to upgrade to the new cable. Most of us won't need that for a long, long time. Despite the fact that big-name TV manufacturers love to show off 8K displays on the CES show floor, the industry is really just settling in to 4K Ultra HD. We're gonna be here for a while, and HDMI 2.0's support for 18-Gbps 4K/60p UHD video and uncompressed multichannel audio is ample for most of us. As I mentioned above, the main exception would be the gamer who wants to move up to a 4K/120 signal; sending a bandwidth higher than 18 Gbps would require the new cable. The good news is, several of the non-bandwidth-related features I described above could be added to existing HDMI 2.0a/b products via firmware update, if the manufacturer incorporated an upgrade path into the gear. As I said, some forms of Dynamic HDR already work over HDMI 2.0, and eARC can be added as an update. Check out this news release that we posted back in July for Denon's AVR-X3400H AV receiver, stating that eARC would be added with a future firmware update. If nothing else, you wouldn't necessarily need to upgrade your HDMI cables when purchasing new HDMI 2.1 gear that supports these functions next year. The bottom line for most home theater enthusiasts is this: if you're thinking about upgrading your system to support UHD, there's no need to wait for HDMI 2.1. Current HDMI 2.0 gear delivers everything you need to enjoy the highest quality AV experience available from today's sources. • Everything You Need to Know About ARC (Audio Return Channel) at HomeTheaterReview.com. • Promising Signs for Broadcast UHD TV at the NAB Show at HomeTheaterReview.com.